BANGKOK, Thailand — A distraught man in Thailand recently pulled a knife on a police officer in taking out his frustration, but the incident ended much differently than expected. 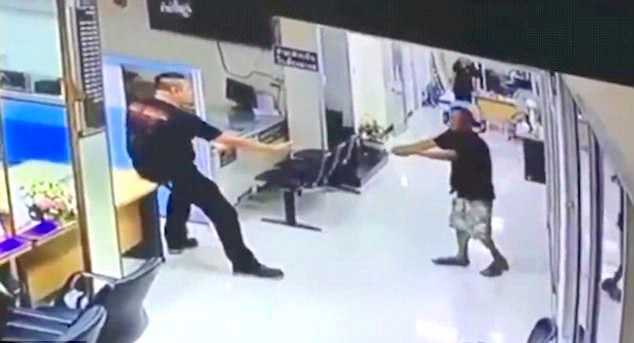 The 45-year-old man, whose name has not been released, entered the Huay Kwang police station on June 17, and pointed a knife at Officer Anirut Malee. But instead of tackling the man, tazing him or pulling a gun, Malee sat down calmly and began talking to him. He found that the man was simply frustrated over negative circumstances in his life. Malee listened to the man’s concerns and offered to give the man a guitar and take him out to dinner. His response helped the man calm down and rethink his actions. “I heard him out and sympathized and said I had a guitar to give him, and suggested we go out for a meal together,” Malee said. After a few seconds, the man handed the knife to the officer. Malee then held out his arms and gave the distressed man a hug. He threw the knife on the floor and ensured the man had no other weapons on him. Another officer clapped upon seeing how the situation ended, and the officers gave the man, who was now in tears, a bottle of water. The man was later sent to a mental hospital for evaluation and was not charged. A video of the incident has generated over 123 million views.